Settlement was before 1840 when the Trinity River was called the Trinidad River. A ferry crossing here was managed by one O. M. Airhart and another ferry operated four miles N of present-day Trinidad. By the mid 1840s the site had a store and a saloon. In 1880 it became known as Trinity Switch, for its station on the St. Louis Southwestern Railroad. That year when the town applied for a post office the word switch was removed and the post office opened under the name Trinidad. Other sources suggest that that it opened in 1891. In 1910 the community reported a population of 70 served by 5 businesses. The population underwent huge growth when a power plant and fertilizer plant opened here. From a population of 750 in 1930, it declined to 550 for the 1940 census. The 1990 population was reported as 1,056 residents, growing slightly to 1,091 for 2000. Three main tributaries-- the West, Elm, and East forks-- feed the Trinity from headwaters in North Texas. Discovery of prehistoric Malakoff Man carved stone heads near this site in the 20th century revealed that humans inhabited the Trinity valley thousands of years ago. Indian villages dotted the river banks when European exploration began. French explorer Robert Cavelier Sieur de La Salle called this waterway the River of Canoes in 1687. Spaniard Alonso de Leon is credited with first using the name "Trinity" in 1690. The fertile Trinity floodplain drew Anglo-American settlers to this area during the Republic of Texas. 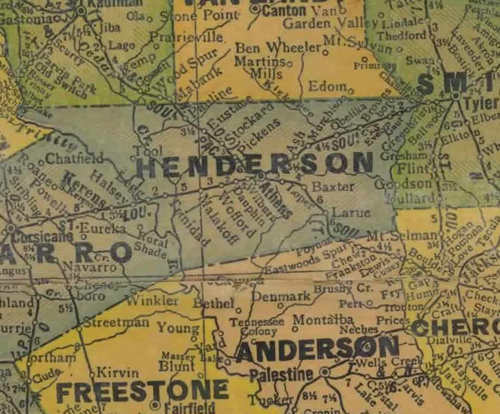 Buffalo, first Henderson County Seat, was founded a few miles upstream at a ferry crossing. Navigation of the Trinity has been proposed in a number of ambitious plans since the 1850s. Steamboats plied the river carrying cotton, cattle, and lumber to Galveston and other Gulf of Mexico ports until the 1870s. Arrival of the railroad ended the era of riverboat trade. Founded in 1881 on the St. Louis Southwestern Railroad, also known as the Cotton Belt, the town of Trinidad had a pump station to draw water for the boilers of steam locomotives. A ferry crossed the Trinity here until a bridge was erected in 1900.